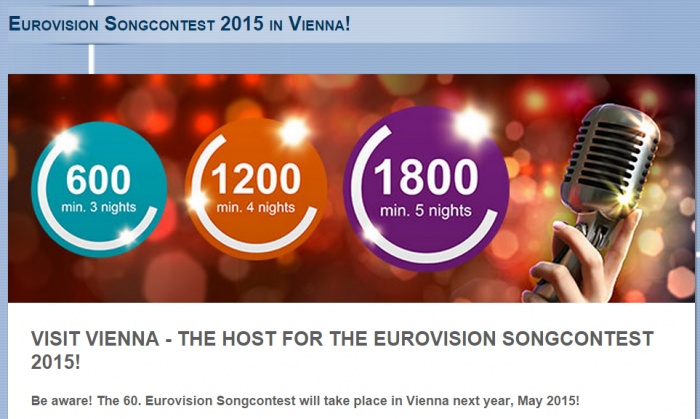 Le Club Accorhotels has launched Eurovision themed bonus offer for stays in the 2015 host city of Vienna for stays in May 2015. You earn 600, 1200 or 1800 bonus points depending of the length of your stays of 3/4/5 nights that are booked by February 28, 2015. Note that this offer is valid for stays in Vienna (or Wien) for the entire month of May, although the Eurovision song contest is only during one week. I went to the Copenhagen during the Eurovision this past spring and had a blast. Trying to make it to the Vienna next spring. This offer was originally only valid for bookings made until the end of December 2015, but Accor has now expended it until February 28. 1. General Le Club Accorhotels terms and conditions apply to the offer “Eurovision Songcontest 2015 and Le Club Accorhotels”. 2. This offer is valid for a stay booked between 11/11/2014 – 28/02/2015 with an arrival date between 01/05/2015 and 31/05/2015at all participating hotels in Vienna & Linz / Austria. *the stay at the hotel and all nights have to be in one selected hotel. 5. You must book your stay ahead of time online on the “Travel Deal Rate” for this offeron accorhotels.com or websites of participating brands) or via call centers to benefit from this offer.